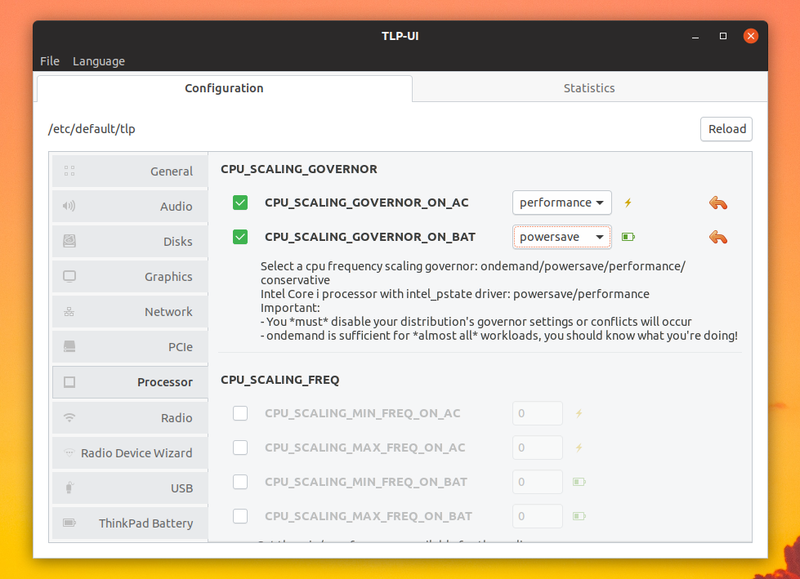 TLPUI is a user interface for TLP, an advanced power management configuration tool for Linux which is designed to increase battery life. TLPUI can read and display the TLP configuration, show default values and unsaved changes, and load tlp-stat to display simple and complete statistics. Back in September when I posted an article about TLPUI, the Linux Uprising Apps PPA didn't yet exist, but since I find this tool very useful, I thought some of you might appreciate having it packaged in a PPA so it's easier to install and update in Ubuntu and Ubuntu-based Linux distributions, like Linux Mint or elementary OS. The Linux Uprising Apps PPA (which is quite new by the way) only has a few packages right now - Birdtray, VLC BitTorrent Plugin, and now this TLP GUI, but I expect it to grow over time. It will only contain software that's not available in the Ubuntu archive, so it doesn't mess with anything that may already be installed on your system, so if something doesn't work, you can just remove the package but continue to use the PPA for other packages. The PPA has TLPUI packages for Ubuntu 16.04, 18.04 and 18.10 (and thus, Linux Mint 18 and 19 too). As an alternative, you can download the DEB packages from the PPA instead of adding it to your software sources. You can also install TLPUI from source - the previous TLPUI article on Linux Uprising explains how to generate a DEB package from its source. As a side note, the PPA package installs a desktop file so TLPUI shows up in your applications menu. You'll need to create this manually if you install TLPUI from source.